Robbie Neilson admitted sounding like a broken record when asked when a new striker would be arriving at MK Dons. The manager, since the start of pre-season, has been aiming to bring in new firepower to lead the line for his side but other than signing Southampton youth prospect Ryan Seager on loan, Neilson has come out empty-handed. After Saturday's 1-0 defeat at home to Wigan, he said he had hoped to get a deal over the line this week, but on Thursday said there has been little movement. "I know I've been saying it a lot in the last few weeks, but it has been taking it a while to get it over the line," he said. "We are looking in other areas as well, so we're working very hard. But the key thing is finding players who will improve the squad. "We're not far away from getting one in and I'd like to get it done as soon as possible." As well as a striker though, Neilson is on the lookout for another full-back. With only Dean Lewington, George Williams and Callum Brittain at his disposal, the manager said another defender has always been on his shopping list, irrespective of Ben Tilney's recent loan to Brackley Town. He added: "We missed out on a main target (at full back) a few weeks ago, so we're onto targets two and three. "It's a difficult position to fill. There aren't a lot around who we believe can take us to the next step. We're digging away and trying to get the right player now." 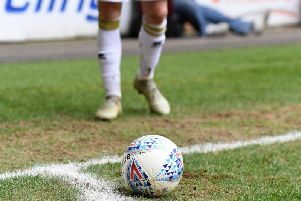 But while the signings are taking a while to get over the line now the season has started, Neilson said, with three weeks of the transfer window still open, there's no need to rush any decision making. "The only issues you have in signing players after the season has started is the fitness levels," he said. "It's a long season, with 46 games and cup games as well, so this initial period is where you try and build your squad. "We're happy to wait and get the ones we want, and then when the window shuts, we gear up and push on."